Los cárteles no existen: narcotráfico y cultura en México [Cartels don’t exist: drug trafficking and culture in Mexico]* (Barcelona: Malpaso, 2018) by Oswaldo Zavala is a deliberately provocative book with a clear central thesis: cartels exist discursively and have been rhetorically constructed thanks to powerful interests, but do not exist as they are popularly understood and repeatedly reproduced in literature, film and television. In Zavala’s words, “lo que con frecuencia denominamos ‘narco’ es la invención discursiva de una política estatal que responde a intereses geopolíticos específicos” [what we refer to as ‘narcos’ is the discursive invention of state policy responding to specific geopolitical interests] (loc 3658). Zavala asserts that these interests are a complex combination of post-Cold War US foreign policy in Mexico and Central America and the consequence of the shifts in power between the PRI and the PAN in Mexico. He summarises these clearly and convincingly. He argues that the aim of the so-called “War on Drugs” and the attendant discourse is to displace inhabitants from areas rich in energy resources (such as Northern Mexico) by the Mexican and US governments for the benefit of private interests. Zavala makes a strong case in a book that is a fascinating mix of journalism and academic analysis. This is not unusual in academic work about the recent violence (see, for example, Watt and Zepeda 2012). These are complementary skills rather than in tension with one another. His background as a journalist is clearly asserted from the introductory pages and determines his style of argumentation. It is a book making a bold case challenging those writing about texts representing (or purporting to represent) ‘cartels’ and narco-violence’ to re-think the language they employ and is a call to those in the creative industries (literature, film, and TV) to produce work nuanced by a more rigorous ethical and political approach. For Zavala, there are many significant markers that reveal how the current discursive and creative fields have emerged. One of these I will be addressing in my upcoming monograph is his periodisation of novels before and after Arturo Pérez-Reverte’s La reina del sur (2002). Reading it as focused on “un personaje tan atractivo y fantasioso” [an attractive and fantastical character] (loc 404), he dismisses the novel as apolitical and facile. This is a discussion I will get into elsewhere. I’m most interested in its adaptation to telenovela (soap opera). He is critical of subsequent novels that copy La reina del sur‘s formula for commercial ends and praises those that he deems are politically astute because, “La literatura puede revelar el verdadero rostro simbólico del poder y la posibilidad igualmente real de confrontarlo”[Literature can reveal the symbolic face of power and show the equally real possibility of how to address it] (loc 2628). His is a large requirement of literature and one that is part of a long and ongoing debate amongst writers and critics. I would have welcomed more engagement with this debate, but this is one of the points where the central thesis and the forward momentum of the argument was given primacy over deeper discussion. In plae of this discussion he argues the case for good examples of novels that write about the violence in ways that situate it within a broader discursive, historical and political field. These do serve to illustrate his assertion that writers (and other creators) need to be responsible and nuanced when setting works against this violence. This is a point he has made, more recently, when critiquing the Netflix series Narcos: Mexico (a piece that chimes with my own on the earlier Narcos). 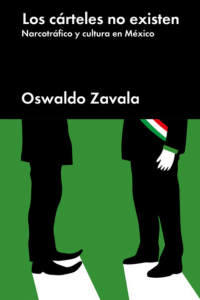 Zavala ably traces the mythology of the most notorious and infamous of the so-called drug kingpins, Joaquín ‘El Chapo’ Guzmán (currently, subject of a show trial in the US). Challenging many of the salient myths, Zavala asserts that El Chapo is but a placeholder for much of the violence committed by others (mostly the Mexican state, sometimes in collusion with the CIA). At others Zavala suggests that El Chapo, his escapes, and the stories that abound related to him have been useful distractions from more significant events and political decisions. Some of the assertions I disagree with and will address elsewhere. For example, I am not convinced by his discussion of feminicide/femicide nor with his wholescale dismissal of the telenovela, La reina del sur (2011-19). ** However, this is an important book that should be heeded. The language used around the violence ascribed to cartels often enacted by government forces really matters. There is an urgency to this book. One of the ways he reminds the reader of this is through the repetition of the numbers of dead between 2008 and 2012, a peak period of violence: 120,000 dead and 30,000 disappeared. Facts that cannot be ignored. These serve more than rhetorical effect, they also ground the discussion in actualité (to borrow a term commonly used in documentary studies). He reminds us that the significance of his assertions are not a mere question of language abstracted from reality, this book is centred on lives lost, absented through brutal means. *All translations mine. I have gone for literal translations to convey meaning. There may be loss of nuance. **Literally, Queen of the South. There has been a less-successful English language re-make of that name. The “war on drugs” gets inverted commas because otherwise it becomes normalised and this phrase, burdened by a terrible history tainted by the blood of many, can be in danger of sounding neutral and even positive otherwise. It has largely been played out in the US and Latin America but can be glimpsed in the different ways it spills out over here. This post is a series of vignettes of interconnected encounters with this so-called “war on drugs” and its victims. Last night, as I was walking home I passed a woman in sports gear. Initially, I thought she was out on a run, like other women similarly dressed who I had passed earlier on my walk. As she neared me I saw the fierce glare, clenched fists, blackened teeth grinding away indicative of meth addicts. She payed me no regard. I was obviously (thankfully) of no interest to her. Crystal meth is not a major problem in this area, but it has seen a slight increase in recent times. As with all cities in the UK and elsewhere, Liverpool has its drug users. Most of these are not visible, while the poorest addicts can be seen occasionally in the city streets. This post isn’t just about that unknown woman, or Liverpool’s other drug addicts or users, but about how she forms part of the multiple layers of the fight over drugs. She is a person whose life I can only imagine and about whom I only know superficial things, some of which are wrapped up in my own concern for my personal safety. But, I feel that I need to keep her in mind to remind me that this is not just an intellectual reflection or one purely concerned with cultural outputs, it is an issue with a human face. This weekend I finished watching Breaking Bad, a series I found compelling, fascinating and, at times, troubling. It is exemplary of the new long-form television series that is carefully crafted and beautifully plotted, and creates powerful male and female characters. It was entertaining and all the while wove in critiques of the US, particularly of its (lack of) a healthcare system. Yet, as I have blogged before and hope to write more about in the future, its representation of Mexicans was troubling. Part of the premise is that the protagonist is an average, even boring, teacher, who is not the sort of person we normally associate with drug dealing, whereas only easy recourse to audio-visual shorthand was required for them to show Mexicans doing the same. I’ve recently completed reading Drug War Mexico: Politics, Neoliberalism and Violence in the New Narcoeconomy by Peter Watt and Roberto Zepeda (London & New York: Zed Books, 2012). Whilst the book is evidently concerned with Mexico and its recent (and ongoing) bloody 12 years long “drug war”, and the complex layers of political and legal complicity in the trade, it also traces how US operates as a primary market for the drugs as well as critiquing successive US governments’ interference in Mexico which have deepened the problem rather than helping to resolve it. Watt and Zepeda provide a detailed overview of the history of drug use, its consumption, the complex trade and clearly lay out the primary Mexican actors in the area as well as establishing how necessarily transnational the marketplace is. They argue for the legalisation of drugs to better control and contain its criminality. One particular fact that stands out for me and that runs against the frequent suggestion in US television shows is how low consumption of drugs is in Mexico. This is for several reasons: the profit motive, that is, more money can be made from sales in the US than in Mexico, and, far from being a haven of excess and wild parties, Mexico is a highly conservative society where drug use is proscribed by tight knit communities. Today, on BBC4’s PM programme there was an interview with wealthy women in California who are calling for an expansion of the legal use of marijuana for health reasons. They were confident that their privilege would aid them in their campaign. Tonight, I watched The House I Live In (Eugene Jorecki, 2012), a powerful documentary describing the effects of the “war on drugs” domestically on the US. Its central thesis was that politics and what is often called the prison-industrial complex have been complicit in creating what David Simon (of The Wire fame) calls a “Holocaust in slow motion”, that is, a class-based destruction of human life. Drawing on interviews with dealers, prisoners, addicts, their families, police, lawyers, judges, prison officers, academics, authors, and spokespeople for NGOs, the film considers how the war on drugs has been differently racialized over the centuries leading to disproportionate levels of Afro-Americans in prison. This has been largely as a result of: the ghettoisation of the urban (largely black) poor; the decrease in employment opportunities in the cities; poor schooling; inadequate reintegration of prisoners; the demonisation of crack cocaine over its powdered form (according to the film there’s a 1:100 disparity in sentencing of the former over the latter); and the cyclical nature of the problem. It points to the origins of the phrase “war on drugs” to the presidental term of Richard Nixon, who used it productively for political gain. This then morphed into a more destructive form under president Ronald Reagan who described it as the “dark evil enemy within” and laid the foundation of the way the “war on drugs” is currently played out in the US. As a film that focused on the domestic it didn’t explore the external “war on drugs” and how this was used as a tool during the “Cold War” to fight an ideological war in the Americas, but did provide a depressing vista of the domestic picture. This does not lead to any specific conclusions, here, it is merely intended as a snapshot of what I have seen, read and glimpsed in the last few weeks and is intended as an insight into how densely packed and multi-layered this “war on drugs” is.